“She wanted to be with Carrie,” her son said. 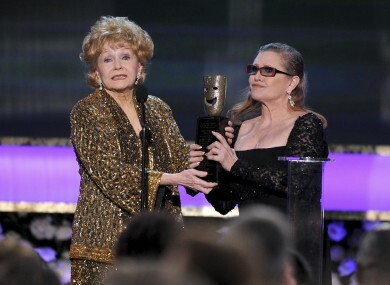 Carrie Fisher, right, presents her mother Debbie Reynolds with the Screen Actors Guild life achievement award at the 21st annual Screen Actors Guild Awards at the Shrine Auditorium in Los Angeles last year. HOLLYWOOD LEGEND DEBBIE Reynolds, who sang and danced her way to fame in Singing in the Rain, has died just one day after her daughter Carrie Fisher passed. “She wanted to be with Carrie,” her son Todd Fisher was quoted as telling industry weekly Variety, hours after the 84-year-old collapsed at his Beverly Hills home and was rushed to hospital. “She’s now with Carrie and we’re all heartbroken,” Fisher said at Cedars-Sinai Medical Centre, where his mother was taken by ambulance earlier today. Reynolds was not yet 20 when she won a starring role in the Gene Kelly musical Singin’ in the Rain. She was also known for her Oscar-nominated role in another musical, The Unsinkable Molly Brown. Email “Carrie Fisher's mother Debbie Reynolds dies just one day after her”. Feedback on “Carrie Fisher's mother Debbie Reynolds dies just one day after her”.